June is going to be a blogger meet month. There are two such meets (or “unconference” as one of them says) going to be happening – one in Pune and one in our very own Mumbai city. So look at your busy calendars and see which one can you make it to. I will be attending the Mumbai Bloggers Meet organised by Sakshi. Mumbai Bloggers Meet – This happens very often and is organized by the problogger Sakshi Juneja. The unofficial spokeswoman for item girl Rakhi Sawant on the internet. They request you to confirm your participation by email so that things can be better organised. So please do that bit. 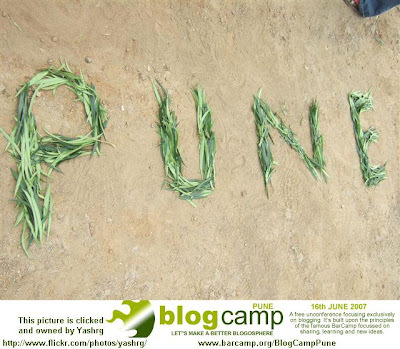 Blogcamp Pune is a free unconference focusing exclusively on blogging, organized by bloggers for bloggers. Itâ€˜s built upon the principles of the famous BarCamp (ad-hoc unconference) focussed on sharing, learning and new ideas. This is going to be an intense event with discussions, demos and interaction between attendees. Any blogger who wants to contribute is welcome and invited to join. This is going to be my first blog party attendance. Have you ever attended one? What do people discuss at these meets? Is it just about sharing blog URLs? What are the other things one talks about? Share your thoughts and spread the word. A lot learning and sharing with fellow bloggers, if there is any particular issue you you want to discuss, you give a talk. If you want to hear about anything, add it to the topics on our wiki. It’s an unconf, no agenda, decide on the day what you want to discuss. will be happy if you can link me in to your blog-roll. Missed it… I think I’ll subscribe to your RSS feed to stay updated! Hi Kapil, please add your blog to our directory of Indian blogs, and pick up an IndiBlogger badge for yourself, thanks! Pingback: bollywood blogs network » Blog Archive » Hello Bollywood Bloggers from Bombay !! !